NEW BRITAIN - It wasn’t long ago that the New Britain boys basketball team had shooting guard Darius Watson for four seasons at the varsity level. Now, he’s in a different spotlight at the high school but a similar one at the Osgood Shootout. Watson was a star for the Hurricanes program and after he graduated in 2010, went on to play collegiate basketball at Division III Albertus Magnus. There he became the team’s third all-time leading scorer and amassed over 2,000 career points, averaging 21.3 points per game in his three years at college. Scoring is what he does best and this weekend Watson is doing so playing for 2 Official. Nowadays, Watson still plays in different tournaments both in and outside of Connecticut, but playing in front of the home fans means a little extra to him. Watson grew up playing basketball with those in his family including his older brother Albie, who helped mold him into the player he became. “There weren’t many competitive games between us because [Darius] always beat me,” Watson said. While the basketball side to the tournament is all about winning the whole thing, it’s about much more than that to Watson and Shaw. Watson was at the Osgood Shootout throughout the day and got a chance to watch the high school division, which featured some kids he trains. Passing down his love for the game to the younger generation is something Watson enjoys doing. 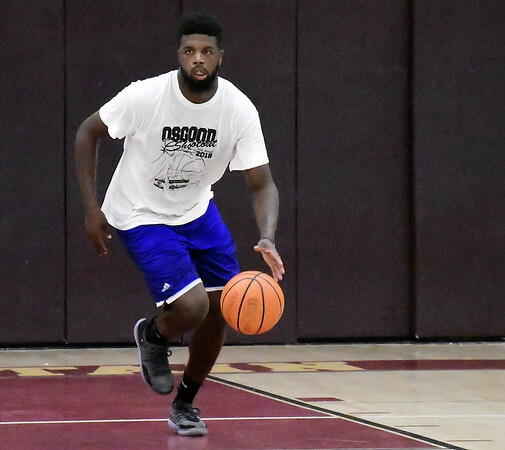 While Watson competes in the Open Division, the next great New Britain player may be in the same gym, albeit at the lower gym level where the high school division was taking place. The talent level at the Osgood Shootout is something that keeps Watson coming back every year. Posted in New Britain Herald, New Britain on Saturday, 18 August 2018 21:46. Updated: Saturday, 18 August 2018 21:48.